Nebraska football fans are now officially settled in for a long offseason, and the first step of any offseason is to define some goals. Sure, winning a national title in 2015 would be awesome, but Nebraska’s odds of doing so are pretty remote. So what are some realistic goals new head coach Mike Riley can accomplish before the 2015 season starts? Here are three baseline goals that will go a long way towards building a foundation for Riley in Lincoln. In the brief few weeks since Riley arrived in Lincoln, his job got a lot more complicated. Ohio State won the national championship, demonstrating (if you didn’t realize it already) that the Buckeyes have a talent pool that can compete with anyone in the country. Michigan hired Jim Harbaugh, who has won big every place he has gone and looks to take the Wolverines’ top-ten recruiting classes and have them competing with That School Down South in a hurry. Add into the mix Penn State, with a top-flight recruiter in James Franklin, being freed from the Sandusky-era sanctions and a Michigan State squad that has lived in the top ten for the last few years, and you can see the B1G isn’t quite the cakewalk it seemed to be. That said, Riley landed four-star offensive guard Jalin Barrett this week, the highest-ranked recruit of the 2015 class. Nebraska’s class, according to 247 Sports, sits at no. 27 nationally and no. 3 in the B1G. With a small class and a short recruiting period, a gaudy recruiting ranking for Nebraska is unlikely. But if Nebraska could at least crack the top 25 with its 2015 class, it would be a promising sign going forward. Yes, that goal sounds quite banal and obvious. But it’s also one of the biggest and most important things Riley and his staff will be doing this offseason. Riley was known as running a pro-style offense at Oregon State, and many were fearful upon hearing of his hire that he would attempt to take Nebraska’s squar-peg roster of zone read players and force it into the round hole of a pro-style offense. New offensive coordinator Danny Langsdorf seemed to quell those fears (according to Rich Kaipust of the Omaha World-Herald). It’s fair to assume that Nebraska’s defense will have the same adjustment, even with new defensive coordinator Mark Banker’s preference for quarters coverage. Brandon Vogel of Hail Varsity has an excellent summary of the similarities and differences between what look to be Banker’s philosophies and what Bo Pelini did on defense. But that means Riley and his staff will have to very quickly get a handle on the strengths and weaknesses of Nebraska’s current roster, so it can start making offensive and defensive plans accordingly. Goal number three comes right on the heels of goal number two, of course. One of the biggest decisions that Riley and his staff will be making this offseason is about the nature of Nebraska’s offense. And what that offense will look like should inform the skill-set of the quarterback that wins the starting job. But it might not be that simple. With a new staff arriving, the door will be more open than ever for a new person to win the starting quarterback job. 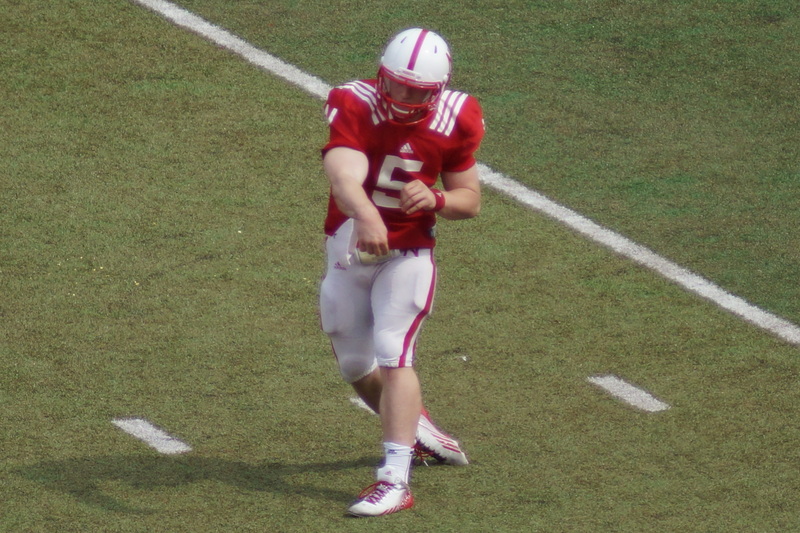 As the coaches look at all five quarterbacks on the roster (Tommy Armstrong, Ryker Fife, Johnny Stanton, Zack Darlington, and AJ Bush), they will be able to assess each of their skills and sculpt an offensive philosophy around the one that they believe gives Nebraska the best chance to succeed in 2015. So deciding on a starting quarterback not only will be a roster decision, but will also likely be an indicator of what Nebraska’s offensive identity will be next season.